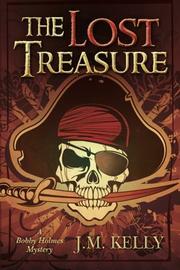 In this debut YA adventure, a group of kids duels with the ghost of a deadly pirate. Young Bobby Holmes from London is about to spend part of his summer holiday with family, including his second cousin Brenda Watson, in America. Already nervous about leaving his mother, Bobby also wants his strange visions to subside. On the plane trip, however, a malicious voice in a dream says, “You will die if you continue this journey.” Yet when Bobby reaches Mountain Lake, Conn., Brenda treats him to charming Americana, such as the Baker Street Cafe and Conan’s Comic Shop. Then a traveling carnival arrives; Bobby, Brenda and her best friend, Stevie, visit a psychic named Madame Tarot. Taking Bobby’s hands, she begins channeling the evil voice from the plane, which now mentions “the captain’s loot.” Later, Brenda’s father says that tools were stolen from his store: two shovels and some oil-lit torches. After a local gravedigger is killed, Bobby tries to explain his theory—that a ghost pirate is searching for lost treasure—to the authorities. Unfortunately, nobody with power or influence believes him. Only Michael, a boy with Asperger’s syndrome, takes the kids seriously, offering his expertise on pirates. Can the foursome stop the specter, or are they already too deep in danger? Debut author Kelly displays a keen, nostalgic eye for childhoods well spent adventuring. His prose is lush with whimsy—“Their mouths began to water like broken faucets”—though he captures natural beauty just as well: “Sunlight streaked through the entangled branches, painting splotches of bright light on the moss covered canvas below.” Mountain Lake, meanwhile, is populated by a grouchy Italian Ice man and cranky gas station workers, among others, likely to draw readers’ suspicions. Amid the genre trappings, there are also excellent messages for younger audiences; when Bobby remarks on Brenda’s very pink bedroom, the tomboy replies, “I don’t think of things that way. You know, boyish or girly. I either like something or I don’t.” This line of tolerance is accompanied by the kids’ acceptance of the socially awkward, though extremely smart, Michael. An irresistibly bright world, packed with winning characters and real danger.